Bonifacio Cordero submitted this photo and caption. After working an event in Corpus Christi, Texas for Revolution, a couple friends and I decided to hit the beach afterward before returning home. 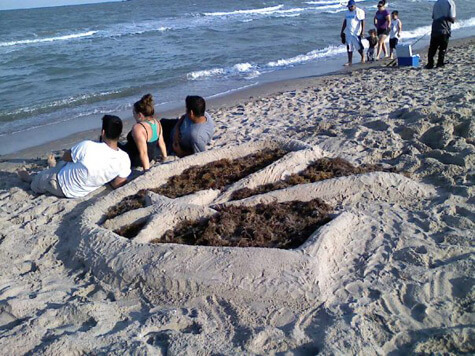 After some time in the water we got together to make the corps' logo "RStar" and just relax in the front. From the left is Micheal Segura (first-year bass drummer) Catherine Grantham (third-year color guard member), and Bonifacio Cordero Jr. (second-year trumpet).